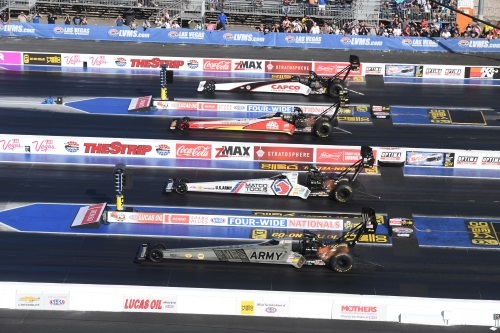 LAS VEGAS – Steve Torrence raced to the Top Fuel victory Sunday at the 19th annual DENSO Spark Plugs NHRA Four-Wide Nationals at The Strip at Las Vegas Motor Speedway as the inaugural four-wide racing experience for fans on the West Coast came to an end in front of a sellout crowd. 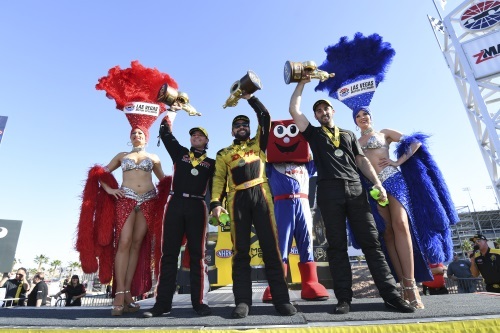 J.R. Todd (Funny Car) and Vincent Nobile (Pro Stock) were also winners in their respective categories at the fourth event on the 2018 NHRA Mello Yello Drag Racing Series schedule. 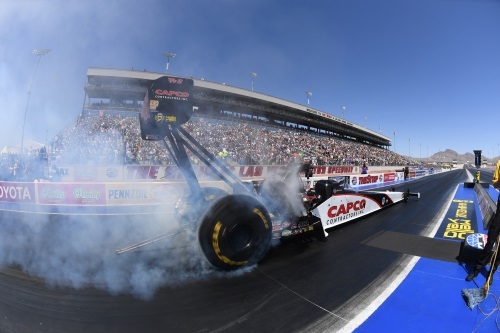 Torrence piloted his Capco Contractors dragster to a 3.771-second pass at 326.63 mph for the 18th victory of his career and second of the season. 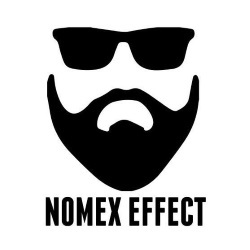 He defeated the No. 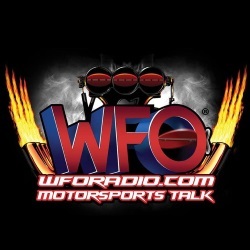 1 qualifier Tony Schumacher, three-time world champion Antron Brown and Doug Kalitta in the final round. 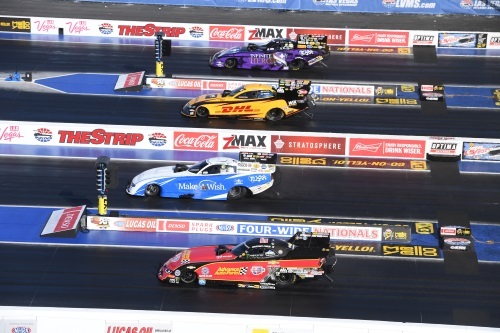 With the victory, Torrence moves atop the Top Fuel points standings as he chases his first world championship in the class. 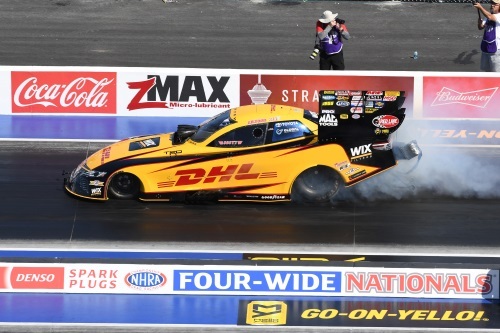 Todd ran a 4.041 at 317.05 in his DHL Toyota Camry for his first DENSO Spark Plugs NHRA Four-Wide Nationals win and 11th of his career. 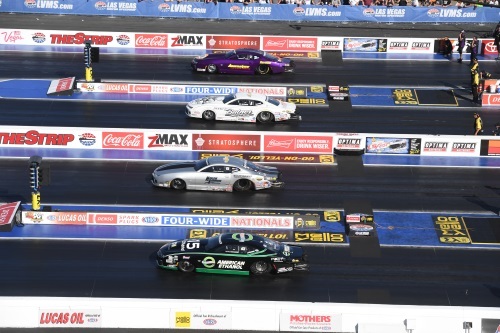 Jack Beckman finished in second after his 4.052 at 312.21, while Courtney Force wound up third and Tommy Johnson Jr. ended in fourth. In Pro Stock, Nobile picked up his 11th career victory and first at The Strip at Las Vegas Motor Speedway when he ran a 6.591 at 210.44 in his Harlow Sammons Chevy Camaro. He bested Deric Kramer, Bo Butner and Chris McGaha in the final round. 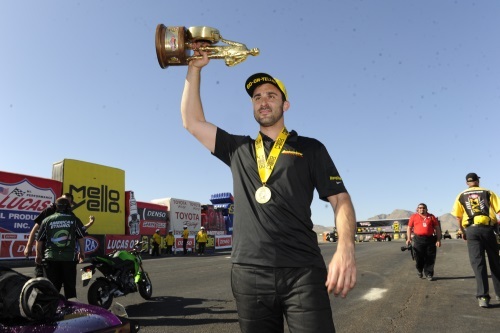 Top Alcohol Dragster — Joey Severance, 5.244, 275.00 def. Julie Nataas, 5.349, 267.32. Top Alcohol Funny Car — Sean Bellemeur, Chevy Camaro, 5.470, 265.69 def. 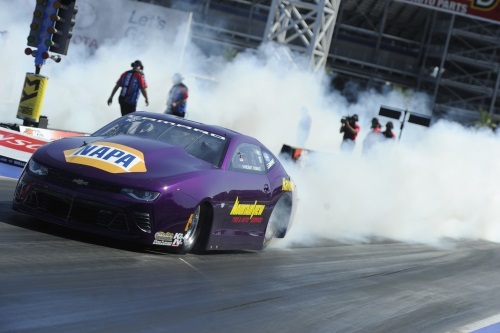 John Lombardo Jr., Camaro, 10.788, 80.67. Competition Eliminator — Joe Mozeris, Dragster, 7.008, 188.25 def. Scott McClay, Dragster, 7.454, 158.59. Super Stock — Justin Lamb, Chevy Cobalt, 8.725, 155.52 def. Brad Burton, Pontiac Firebird, Foul – Red Light. Stock Eliminator — Justin Lamb, Chevy Camaro, 10.025, 130.51 def. Larry Gilley, Dodge Dart, 11.043, 117.84. Super Comp — Bradley Johnson, Dragster, 9.067, 168.39 def. Ryan McClanahan, Dragster, 9.081, 175.39. Super Gas — Michael Miller, ’27-T Ford, 10.037, 145.28 def. Aaron Kinard, Chevy Corvette, 10.029, 163.18. Top Dragster presented by RacingRVs.com — Mike MacBrair, Dragster, 6.617, 203.00 def. Steve Casner, Dragster, 6.738, 198.12. 1. 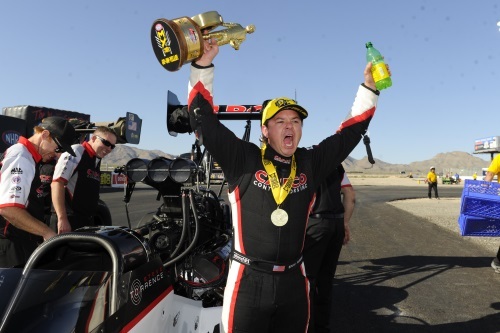 Steve Torrence, 333; 2. Tony Schumacher, 300; 3. Antron Brown, 290; 4. Clay Millican, 255; 5. Doug Kalitta, 248; 6. Richie Crampton, 215; 7. Leah Pritchett, 202; 8. Scott Palmer, 195; 9. Brittany Force, 158; 10. Terry McMillen, 148. 1. 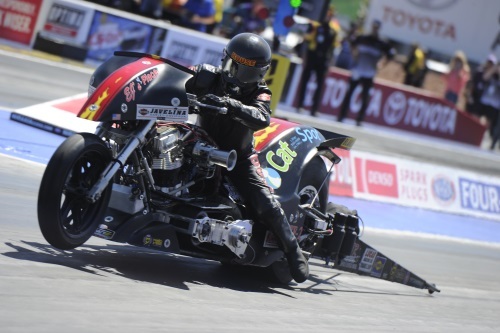 Jack Beckman, 338; 2. Courtney Force, 302; 3. Matt Hagan, 301; 4. Tommy Johnson Jr., 265; 5. Ron Capps, 258; 6. J.R. Todd, 235; 7. Robert Hight, 222; 8. Shawn Langdon, 205; 9. Jonnie Lindberg, 171; 10. Del Worsham, 167. 1. Bo Butner, 322; 2. Chris McGaha, 293; 3. Deric Kramer, 289; 4. 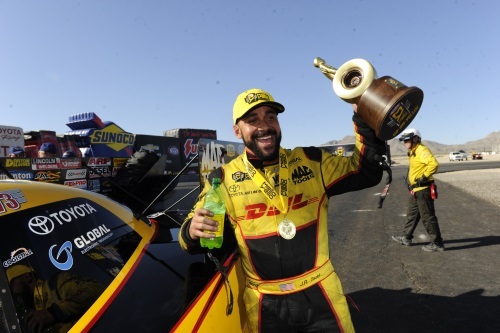 Vincent Nobile, 283; 5. Jason Line, 268; 6. Greg Anderson, 253; 7. Drew Skillman, 242; 8. Tanner Gray, 229; 9. Alex Laughlin, 212; 10. Erica Enders, 198.